Datasouth has been developing websites since 1998, and during that time, we’ve worked with many different CMS. For many years, before the advent of mainstream open-source CMSs, we developed our own DCAS (Datasouth Content Administration System), which formed the core engine for many of the websites still in use today. Whilst it was flexible enough to allow any application to be developed, it required constant in-house development that was time-consuming and expensive. Fortunately in 2013, we discovered concrete5 that did everything we wanted and more: It supports a true model-view-controller development platform, which effectively means that design, data, and functionality are kept independent of one another. In practise, this means that you can build a website that looks great in 2015, yet can be completely redesigned in 2016—without rebuilding any of the core functionality behind the scenes. In a similar vein, if you require bespoke functionality at a later stage, you can integrate this easily as a package without breaking the underlying core engine or modifying the design. We asked various members of the Datasouth team why they like concrete5, and they all love it for many different reasons. "I like concrete5 because it allows your website to be an organic thing. Datasouth had spent ages with a dated, non-responsive, and somewhat ugly website. To move, the thought of going through the process of planning, designing, and writing new content for everything we wanted to say was too daunting—so we did nothing. Eventually, embarrassment got the better of me, and we decided to put up a small holding page using concrete5. As time went on, I decided to add the blog, and of course, I am now free to publish anything anywhere on my site without needing to go back to the developers. As such, it means that we can keep our site updated easily and add pages as and when they are required." "With concrete5, I can develop any bespoke functionality, and integrate it natively with the core concrete5 dashboard and native user interface. Its CMS is readily available for administration (i.e., pages, users and access list). It makes development of add-ons easier, faster and more efficient. 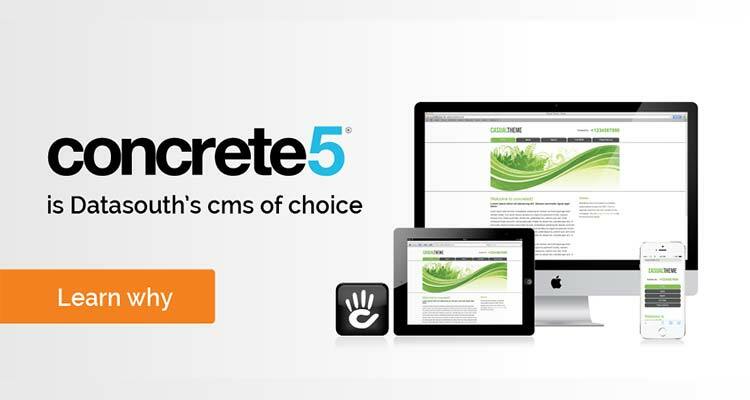 Concrete5 enables me to focus more on the functionality and logic of the website. With its standard MVC implementation, extending and customising becomes child splay." "To be able to produce a great design (what you see) and user experience (what you feel) without being limited by a developer saying ‘you can’t do that’ is every good objective for a web designer. With concrete5, this has been made easier, as it has a broad range of editing and theming capabilities, allowing artistic minds the flexibility to explore endless ideas and bold new design practices." "Ultimately, it is the end-users and site editors who benefit the most from concrete5’s flexibility and power. Editors are no longer restricted by the Web designers and developers. They now have the freedom to create user-friendly and engaging sites that are easy to find (search engine-friendly), and can be regularly updated and altered with only the limits of their own imagination. Content population has never been easier." "Concrete5 has a well-implemented in-line editing feature, which makes it easier for non-technical content editors to add, edit, and delete content. Content tools, properties, or any sort of tool you need are very easy to locate and adjust. With well-optimised templates that conform to all current SEO standards, it is easy to achieve some excellent first page results in Google." Whilst concrete5 is a newcomer in the CMS space, we believe that it’s one of the most customer-friendly and flexible CMSs around. It’s here to stay and will become one of the heavyweights when it comes to content management on the web. If you would like to find out more about how Datasouth can help you with a concrete5 project, give us a call on 023 8089 0800 or contact us via our contact form. Want to know more? We’ve listed down 10 great reasons why you’ll love concrete5 for your websitein a simple infographic.